Dr. Bob Musil, President and CEO of the Rachel Carson Council, was the featured keynote speaker for San Diego State University’s GreenFest, a week-long celebration of Earth Day and sustainability. SDSU is another campus leader in sustainability whose President, Elliot Hirshman, has signed the American College and University Presidents’ Climate Commitment. Musil was invited to SDSU by Dr. Geoff Chase, Dean of Undergraduate Studies, the editor of Sustainability in Higher Education: Stories and Strategies for Transformation (MIT Press 2013), and a pioneer in the campus sustainability movement. 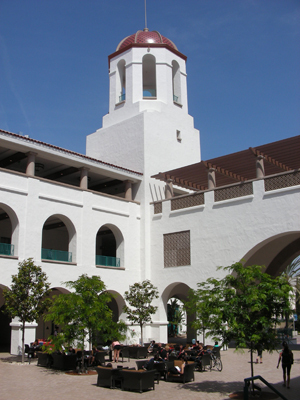 SDSU is noted for its students’ commitment to sustainability by voting to create a student fee to support campus-wide sustainability including creating green buildings. Musil spoke to a large lunchtime crowd of students and faculty in the main auditorium of SDSU’s Conrad Prebys Aztec Student Union. The Aztec Union, paid entirely by fees approved by students, is a LEED-certified platinum building which won the award for Best Overall Sustainable Design at the 10th Annual Energy Efficiency and Sustainability Best Practice Awards. San Diego State and the College of Environmental Design have also joined the Rachel Carson Campus network.